IDJ: When Hong Kong was liberated in September 1945, one of the military groups diverted to assist restoring the city’s electricity, gas and water utilities and railway was the Royal Air Force’s No. 5358 Airfield Construction Wing that was part of Shield Force. This fleet of Royal Navy Cruisers and Aircraft Carriers plus their support ships were transporting 3000 airman and all the equipment and machinery needed to construct airfields on islands close to Japan where American troops were slowly defeating the Japanese. Lancaster bombers were to follow to bomb the Japanese mainland from these airfields, although the American Army Air Force had already been doing this very effectively from bases in China and the Pacific Islands. However before the RAF could start their task the Japanese surrendered after the dropping of atomic bombs on Nagasaki and Hiroshima. The ships of Shield Force were relatively close to China and diverted to liberate and secure Hong Kong. As soon as the colony’s situation had stabilised, the RAF contingent’s leaders appear to have come to a decision that Kai Tak airfield was far too dangerous to use in the future and must be abandoned. However, a recent inspection of documentation in the National Archives in London reveals that the Air Ministry in the UK was involved in planning an alternative civil/military airfield even before the Japanese had surrendered. A preliminary ground survey was made for a joint civil/military airfield at Ping Shan 20 miles from the city in the north-west New Territories. The site had been selected from maps and an elderly Hong Kong resident released from a prisoner-of-war camp guided the RAF’s survey team to an area which had not been visited by Europeans since the Japanese invasion in 1941. They reported favourably on the site covering 7.5 square miles where life had hardly changed for centuries. The location seemed ideal, with approaches over the sea and through a valley which was fairly level, but hills were on either side, including the substantial mountain at Castle Peak to the west of the southern approach. A number of villages and homesteads would have to be moved, but more importantly to the local people it would involve cutting down and the removal of several hills which were important ancestral burial grounds. Cutting across vast swathes of paddy fields, the runway was planned to be 1,800 metres (5900 feet) long and 45 metres (150 feet) wide, beginning from Nai Wui village and ending about 280 metres (920 feet) beyond Shek Po towards Deep Bay, passing through Sun Fung Wui, Chung Uk Tsuen, Tin Sum and Li Uk Tsuen. The runway was planned to be extendable by another 800 metres (2,600 feet) and double the width at a later date. The RAF’s No. 4857 Quarrying Flight set to work on a hill of granite and they commenced digging out a new channel to divert a river. The construction squadron was moved from Kowloon to a tent camp on one side of the valley and, as might be expected, the villagers became very alarmed. Initial preparations were completed and access roads and a con­necting light railway were built to a quarry which commenced producing 15,000 tons of broken granite monthly. Many high-ranking officers visited the site, including the Commander-in-Chief (Far East) Lord Mountbatten. 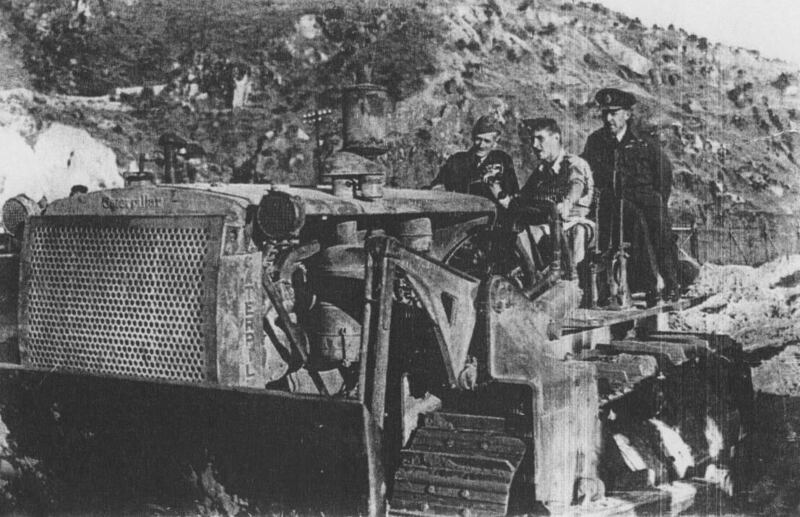 On 27 October 1945 Air Chief Marshal Sir Keith Park and Admiral Sir Cecil Harcourt (an earlier Governor of Hong Kong) visited Ping Shan and to impress them a special rock blast at the quarry was laid on. Hundreds of workers were necessary and local people were trained to operate the construction equipment. The selection of trainees presented difficulties as they were mainly farmers who had little mechanical knowledge. An advertisement was placed in the local press giving two days for interviews, The RAF Officer-in-Charge (School) visited Ping Shan to find a crowd of 2,000 waiting to be interviewed, in addition to which the elders of the neighboring villages had brought a further 1,200 applicants. The period of instruction was planned to take six weeks and was divided into three sections: Tractors and Scrapers, Excavators and Galion Graders and miscellaneous plant. The organisation of the school followed that already used by similar schools in Germany’s reconstruction. It was found impossible to translate the servicing schedules into Chinese as the technical terms had no absolute equivalent. It was therefore decided that tuition be confined to operating machines only, and when the operators eventually went out on sites, special servicing gangs composed of RAF personnel were formed. The training ground covered 25 acres with disintegrated granite as its stratum, which was ideal for training purposes. It was firm and when bulldozed or scraped left a smooth bright surface. There were several raised surfaces about 3m (10 feet) high on the site which were ideal for face-shovel training and also a deep nullah where drag-lines machines could be operated. 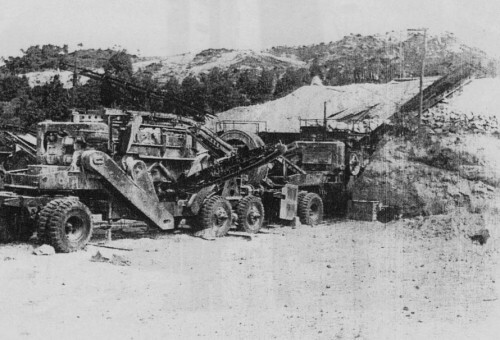 Adjoining the machinery plant school was a training area for drivers who under instruction on Tippers, were made to reverse along a difficult road to the Excavators where the advanced trainees were gradually schooled into the gentle art of filling a Tipper without knocking the body off. A third school was started for a conversion course for mechanics some of who were experienced on petrol engines, but lacked diesel experience. Things were going well, with the machinery plant school training locals to be operators on the six week courses. 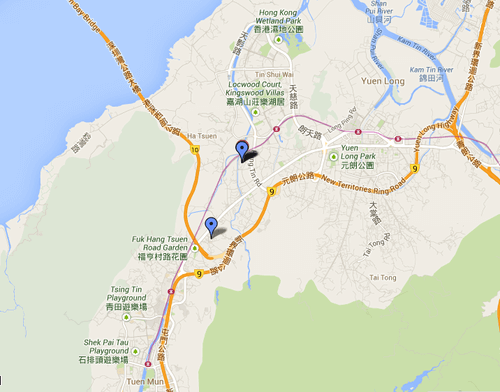 The road between Tsuen Wan and Tai Mo Shan Peak was rebuilt by the Construction Wing to take heavier motor traffic. The clearing of the hill outcrop at Tai Wai Shan in the Ping Shan valley needed the removal of 250,000 tons of rock. Construction continued with high expectations and activity until March 1946 when all the frenetic activity came to a sudden halt. The UK’s state airline, the British Overseas Aircraft Corporation (BOAC) had belatedly sent out a delegation to look at the site which they quickly declared as unsuitable for the needs of their future aircraft, and that it was too far away from the city. BOAC was relying on flying boats for its Empire air routes at this time, so needed water bases as well as land runways for its mix of aircraft types. Also new International Standards were coming into force dictating the design of airports world wide. These Ping Shan did not meet as the southern approach was deemed to be too narrow through the Yuen Long valley, as was the initial width of the runway, and the northern route out over Deep Bay would be too close to the Chinese border. Undeterred by this set-back, the RAF contingent was prepared to finish the construction and use the runway solely for military purposes. However, the Air Ministry in London was under pressure from the new Labour government which refused to fund it any further. In April 1946, work was abandoned to the great relief of local residents who had objected vehemently to losing productive rice paddy fields and their ancestral homes, temples and graves. The affected villagers, mainly from the Tang family had by this time generated substantial support from the Chinese government for their grievances and it was making strong diplomatic representations to the Hong Kong and UK governments on their behalf. The RAF did not entirely give up on the area as they stationed mobile Radar units there in the 1950s with their antenna pointing towards Deep Bay and the now communist China. This was the period of the Korean War when the UK had troops there fighting the North Koreans and the Chinese forces. Today the agricultural land and paddy fields have disappeared under the residential tower blocks of Yuen Long town and the Tin Shui Wai residential estates. Quarries exist on the south western side of Ping Shan which are thought to be the only remains of this project. However, Tang family village ancestral halls and a pagoda do remain that have become historical attractions promoted by the tourist authority. It is doubtful whether the version of the Tang’s history given to visitors ever mentions that the area very nearly became Hong Kong’s international airport. A short film of Air Chief Marshall Sir Keith Parks visiting Hong Kong and the airfield’s construction site is held by the Imperial War Museum archives in London.